Today would be the day we crossed to Phuket and it would be our last day of cycling, before continuing on with a ferry to another island. At around 7 AM, we had a nice breakfast at the same stall we went yesterday at Khao Pi Lai. There were a lot more varieties of foods in the morning compared to yesterday afternoon. There were many people stopping by to buy those foods as well, in which they were already been packaged and ready to take away. The whole family and relatives were at the stall to help out and they all lived in the neighbourhood. 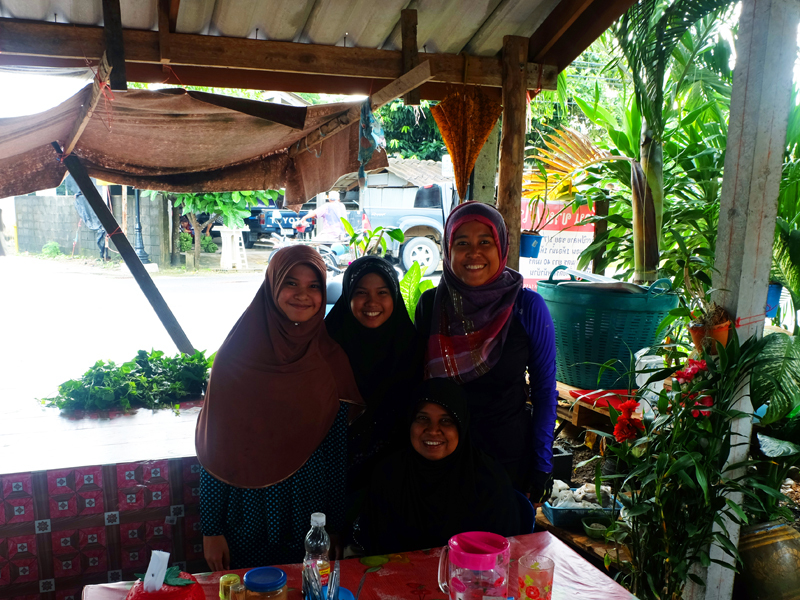 I asked them where to buy a fried rice in a pineapple, a Thai dish that I had been wanting to taste for a long time. Instead of telling me where exactly I could find it, they offered to cook it for me! Such a nice offer – but unfortunately, I had to decline it since we had to cycle to Phuket today. Well, next time! They told us to visit them again if we ever go to Thailand again. 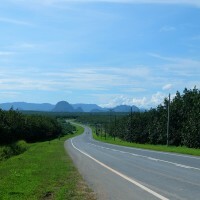 Within few minutes of cycling from Khao Pi Lai, we were on the Sarasin Bridge – a bridge that connects Phuket and mainland Thailand. The ride to Phuket Town was nothing to shout about. There were no quiet roads to go to. We had to take the main road, in which we had to share it with motorcycles, cars, and big size trucks. The emergency lane in Thai roads is very wide, so it is generally safe to cycle on the main road. But the downside of riding on the main road was that we did not get to see much. I was quite bored of the long straight road with fast moving vehicles around me. The only thing I noticed was the huge thunderstorm clouds forming above me. Oh… not again!, I mumbled. 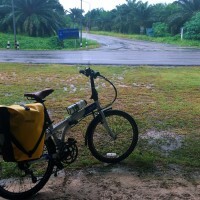 Thankfully, it did not rain at all for the whole journey to the town. 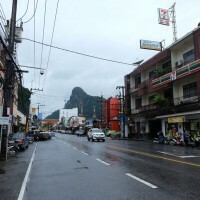 The clouds moved towards the north eastern side of Phuket, and most probably, it would rain heavily in Phang Nga Bay. After more than three hours of cycling, we finally reached the Rosada Pier to get the tickets to Koh Phi Phi. The tickets cost 1000 Thai Bhat for each person, which included the ferry ride back to Krabi. As much as I wanted to go to a less touristy island of Ko Yao Noi, the clouds formation that I saw earlier forced me to reconsider my options. Ko Yao Noi is not that far from the Phang Nga Bay, so I would not want to risk it! My last few days of this trip had to be sunny! So I would rather go to Phi Phi Island instead. 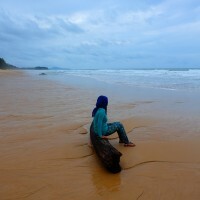 The woman in the ticket counter also assured me that there would not be any rain tomorrow – in Phuket and Phi Phi Island. So I was quite delighted to hear that. Finally, I could see the shining sun on our last two days of this trip! From the Rosada Pier, we went to Phuket Town and decided to stay around there so that we did not have to cycle for quite a distance tomorrow morning in order to catch a ferry. 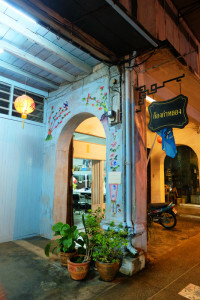 We checked into Machima House at Phuket Road which was located at what looked like a “China town of Phuket”. The whole town has a strong resemblance of Penang’s George Town, with its Portuguese-Chinese architecture touch. As expected, the town is very touristy. There were plenty of hotels and guesthouses for people with different budgets, expensive restaurants and cafes, as well as souvenir shops. 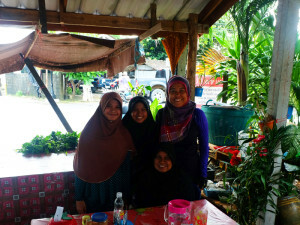 I had not seen any groups of tourists since I left Krabi so it felt quite weird. Thanks to tourism, everything in Phuket Town was 2 or 3 times more expensive than Krabi, Natai Beach and Phang Nga. It was insane! Usually, we would spend around 120 Baht for a two-person meal. 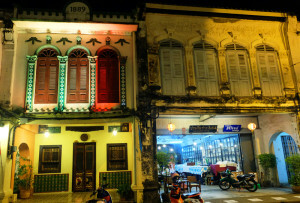 But in Phuket Town, we had to spend around 300-400 Thai Baht! It was a complete rip-off! It was sincerely my mistake for not checking out the price beforehand, but none of us expected the price would jump so high considering we ate at a mediocre-looking restaurant. So, when it comes to buying foods in Phuket, here are my two cents: if you want to eat cheaply, go to a local wet market or go a bit outside of the town. We found a halal restaurant (which looked similar like a Mamak stall) at Viraponghongyok Road, located a few meters away from a roundabout. The foods there were delicious and you could choose different kinds of side dishes. We ordered so many side dishes and in the end, we only had to pay 140 Thai Baht for two persons! It was indeed a relief! 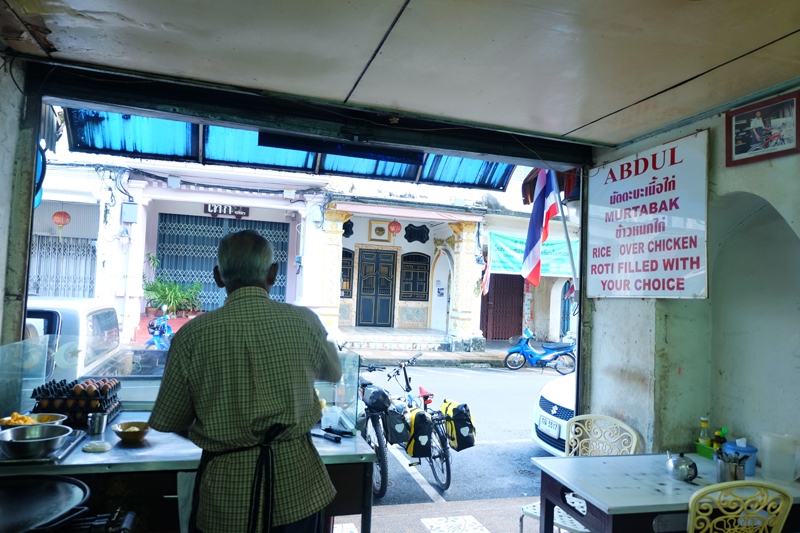 But no matter how expensive foods in Phuket are, one should never miss the super life-changing, crunchy, and delicious roti by Abdul at Thalang Road. That was THE best! There were two places selling roti at the same road. 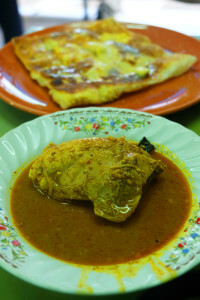 Both were famous, but many recommended the Abdul Roti. We managed to go there in the morning before we took the ferry to Koh Phi Phi. We ordered two banana roti (my favourite! ), two chicken roti (with curry), and 2 teh tarik – the total was around 400 Thai Bhat. Just like in Malaysia, the roti was brought by South Indian migrants along time ago. But unlike the ones found in Malaysia, the roti here is mixed with an insane amount of sugar and condensed milk, which makes it surprisingly so much nicer for breakfast or snack! I loved it! 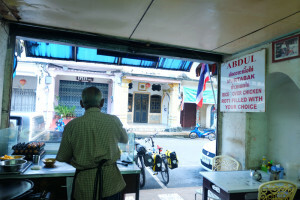 Oh, by the way, we went to the Abdul Roti place at around 6:30 AM and both roti stalls already opened at that time. So this is something you definitely need to try before you leave Phuket.